First, let me remind you of the special 40% discount that I’ve provided you with on the latest releases – “Killer Endgames” by GM Nick Pert (LINK) and “Killer Grand Prix” by GM Gawain Jones (LINK). Use the coupon “simon40” when making your purchase. 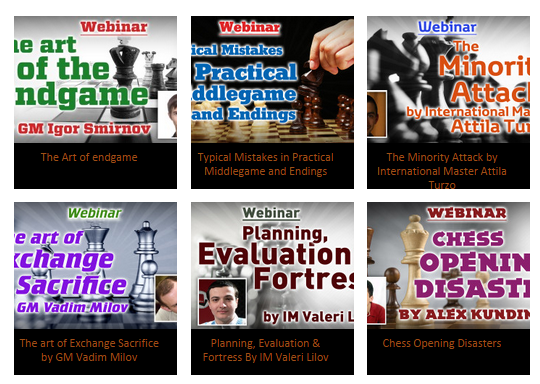 KILLER ENDGAMES AND KILLER GRAND PRIX RELEASED, AND INSTRUCTIVE CHESS GAME! Some players may have lethargic thoughts about the endgame stage – that it’s the final stage of the game and that not much importance is to be given to it. Similarly, there are some players who give a lower priority to the opening stage as well. Recently, lots of students have asked me to adapt my courses for iPad/iPhone, tablet computers, etc. I’ve just found a good way to do so easily and really nicely. Moreover, it will simplify and improve the learning process for you in many ways. Today we have an interesting topic to discuss. It’s called “Piece coordination and maneuvering in chess”. As you may know, the game of chess is nothing without the pieces. If the players don’t move (or use) their pieces, the game is simply ‘dead’. Just like how all players need to be involved in a football game, when it comes to chess, you have to use your pieces and bring them into the battle. First, let me remind you of our new chess opening course, the “Bogo-Indian Defense” (LINK) and the special offers. You can get a 30% discount (you save about $6) on the course by using the discount code “bogo30”. This discount will be valid only till tomorrow, Friday, 14 August. Additionally, if you already own my course “The Grandmaster’s Opening Lab – 2” (LINK), you will get the course “Bogo-Indian Defense” with a massive 50% discount. We have already contacted the buyers of “The GM Opening Lab 2″ offering the discount. If you still did not get our message or you changed your contact details, please contact us (LINK) and we’ll be happy to provide you with the 50% discount. Some people have asked me if my courses work and if they are effective. I think that the best way to answer that is with the feedback from those who have studied them. Dear Igor, I recently played a rapid tournament and I probably scored the best result of my life, finishing in second place in a tournament that included a few GMs and IMs. In the last round, I won a key game, beating a GM! I would like to share my thoughts during the critical position and how your teaching helped me win that game. Here the first move that came to my mind was the aggressive 23.Nxh5+!?. The time rate was 7 minutes plus 3 seconds per move, so I had to make a quick decision. The critical line that I started analyzing was 23…gxh5 24.Nf5+ Kg6!? Black challenges White and tries to hold his position together by defending h5. Here, two possibilities came to my mind. The ultra-aggressive 25.Bxf4 exf4 26.e5 !? – opening lines against Black’s king at any cost. On seconds thought, I realized that the knight on f5 is not a knight, but an “octopus” as the great GM Garry Kasparov used to say. Here, White has two pawns for the piece and Black has a very passive bishop on a8 (hitting against a “wall”) and an open king. I learned from Igor’s great course “The GM Positional Understanding” (LINK) how important activity of pieces is, and that helped me asses this quickly. By understanding the general position, I saved a lot of time in double-checking tactical details. In this case, I can hardly call 23.Nxh5+ a piece sacrifice! Fortunately, I had a third thought which was the most important and the one that made me win the game. 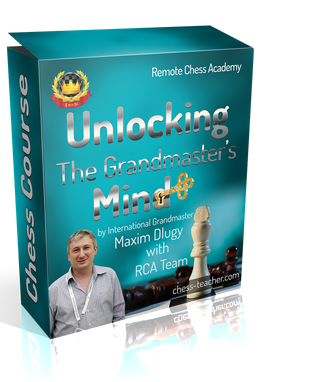 I remembered the preview video of the course “Unlocking the Grandmaster’s Mind” (LINK). At around minute 5.50 (see that video here: LINK), your exact words – that during a practical game, “you don’t have time to calculate all those lines accurately” – resounded in my head. This FREE lesson gave me the confidence to make the move 23.Nxh5+ fairly quickly, based on understanding rather than impossible calculation. I suggest watching that lesson because the information is just too powerful!! My opponent, a Grandmaster, finally rejected my piece sacrifice at the cost of a pawn. I managed to win another pawn and win the game. Once again, I want to say that what really made the difference was having that key knowledge that I was lacking before it was provided by you. Firstly, please accept my heartfelt congratulations on your recent success! Your game against GM Slipak was not just a victory, it was a total demolition! Your best achievements show your TRUE POTENTIAL in chess. If you were able to beat a GM in such an impressive manner, it proves that you can do so in the future, too! Practical aspect: it’s easier to attack than to defend. After you play that 23.Nh5 sacrifice, there’s a good chance that your opponent will start thinking longer and will appear in time trouble. Psychological aspect: by playing such bold moves, you crush not only opponent’s position but his self-confidence, too. You demonstrate that you don’t fear your opponent, even though he’s a GM. You play for a win. You play the move your opponent overlooked. This makes your opponent feel frustrated and he may start playing badly. That’s how former world champion Mikhail Tal won so many games. This time you’ve made your perfect shot! There’s an important lesson about defense you can learn from this game, too. Should Black accept White’s sacrifice? What do you think? If Black refuses to take the knight, he’ll end up with material deficit and destroyed position. This is a certain loss. If Black grabs the knight, he may be mated soon. On the other hand, if he is not mated, Black will end up with an extra knight. You see, it is a double-edged sword. The only way to refute a sacrifice is to accept it. If you are going to suffer, at least do so for a reason. Grab some material as compensation. Manuel, let me congratulate you once again on your 2nd place in a tournament, obtained by such an impressive victory over a GM in a decisive round! Finally, thanks for sharing your game and experience with us! I enjoyed the game and your comments a lot, and I’m sure the other students will like these, too. WHOLE PACKAGE : 177 USD DISCOUNTS! 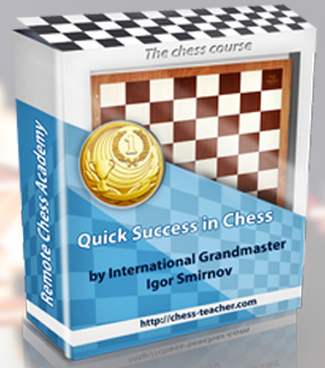 Some time ago, we released the course “The Grandmaster’s Openings Laboratory – 2” (LINK). It received mixed feedback from our students. Those who studied the course appreciated good analysis of the openings. Some of the students were even able to defeat IMs/GMs using the lines provided. However, the other group of students wasn’t particularly happy. they were interested in some of the openings presented in the course but not in all of them (as they don’t play some of the openings presented). In order to address these requests, we are considering splitting “The GM’s Openings Laboratory – 2” course into separate openings, thereby making it possible for you to purchase any particular opening for a relatively small price. In order to improve it further, we’ll record the additional video lessons explaining each opening. Feel free to let me know if you like this idea (you may write your comments below). We’ve already prepared the dedicated opening course about the “Bogo-Indian Defense“. If you like this type of opening course, I’ll keep producing new ones. Of course, I’ll take into account all the additional requests you submitted during the recent survey (LINK) and via comments. Therefore, our new opening course “Bogo-Indian Defense” is being released today! The author of this course is our guest coach GM Levan Aroshidze. The Bogo-Indian is a solid and positionally sound opening. It can be used against both weaker opponents (whose positional understanding is lacking) and against strong rivals (because it gives you a very solid position). Hence, you can be ready to go in for the fight! Now comes the important part – special offers! I’m going to provide everyone with a 30% discount on this course. This offer will be valid from today (11 August) to Friday, 14 August (inclusive). As you can see above, I wrote that the practical part is taken from the course “GM’s Opening Lab – 2” (LINK). We value those loyal students who have already bought and studied the course “GM’s Opening Lab – 2” and we’re going to treat them in a ‘special’ way! If you are among them, accept my congratulations because you’ll get a massive 50% discount on the course the “Bogo-Indian Defense”! We’ll contact the students who already bought the course “GM’s Opening Lab – 2″, shortly and provide them with the 50% discount! So, just grab the course now and enjoy learning! Additionally, we had a discussion on our Facebook page (LINK) on the topic: “What should the best chess opening course contain?”; and remember that the person who gets the maximum number of ‘likes’ for his/her comment would get the course the “Bogo-Indian Defense” for FREE. And the winner is Radja, who has got 10 ‘likes’. Congratulations Radja – thanks for sharing your thoughts with us, and enjoy studying the course! Also, I thank everyone who participated in the discussion – you can still get this course with some special offers (that are mentioned above). 2. "The Grandmaster's Openings Laboratory"
3. "How to Beat Titled Players"
10. "GM Opening Lab 2 BONUS"
Get this massive 177USD DISCOUNTS when you buy from this LINK Only! Hurry up before the promotion end. CLICK HERE to read more. How to beat a weaker opponent?